Simply get instant discounts, just apply King Power Membership now! Accumulate spent for upgrading membership level to be “Crown member” status. Enjoy up to 20% discount and extra benefits. 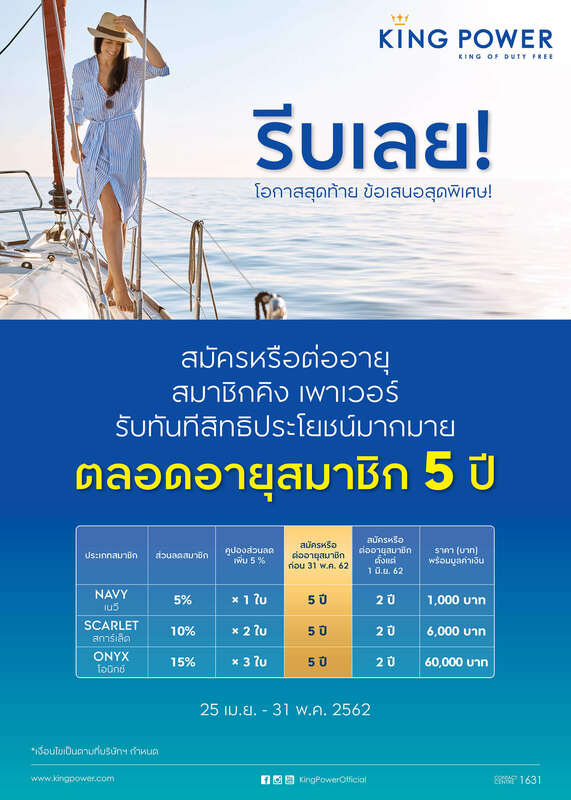 2nd offer: Receive 25%Cash Back at King Power Suvarnabhumi, Don Mueang and Phuket Airports. Have a relaxing trip before you even take off with complimentary access to King Power lounges with your companion* at King Power lounges nationwide, especially in Suvarnabhumi, and Don Mueang Airports. Special privileges from participating exclusive partners in airline, hotels, foreign exchange, car rental, tour packages, and others travel related businesses. 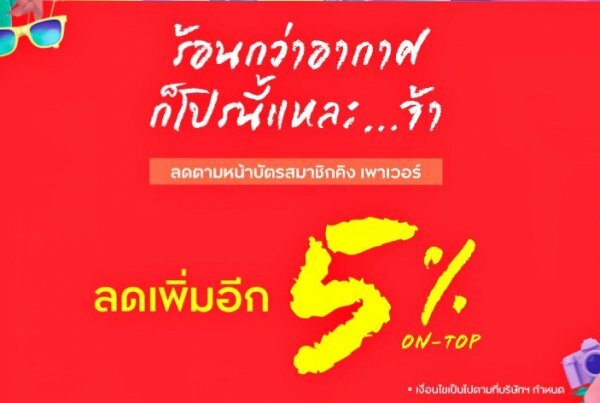 Special discount at participating restaurants in Suvarnabhumi, Don Mueang, Phuket airports. 1. This coupon is eligible for participating merchandises only. Please verify the list of participating merchandises at point of sales. 2. This coupon can be applied with membership discount, and it is valid for a single regular-priced item. 3. 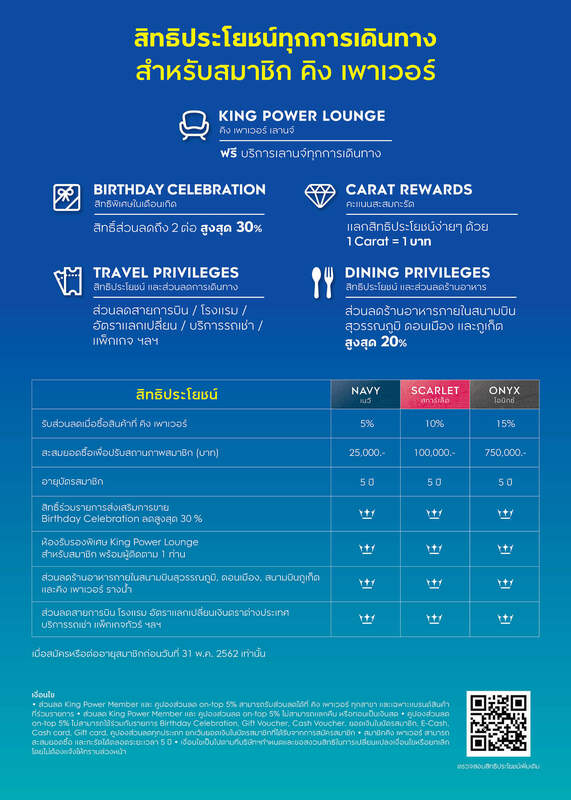 This coupon is invalid for the use in conjunction with the King Power Membership Package bearing corresponding serial number only. 4. This coupon is invalid for the use in conjunction with Birthday Celebration, Gift Voucher, Cash Voucher, Cash Card, Gift Card, E-Purse, E-Cash, and all types of discount coupons, except for the smart purse for new membership. 5. 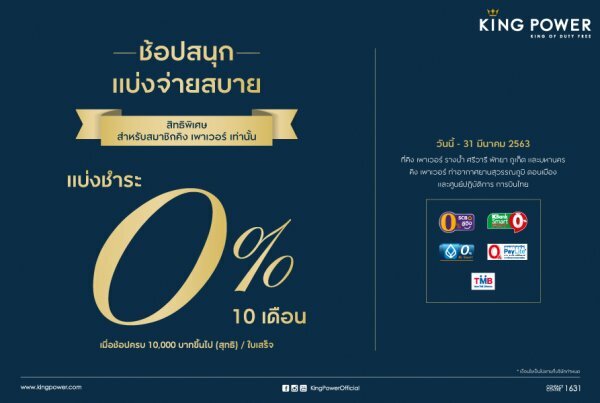 This coupon is valid to use at King Power nationwide. 6. This coupon is non-refundable and non-tranferable for cash or change. 7. The Company reserves the right to change or edit terms and conditions without prior notice.